Rarely will law enforcement agencies ticket and prosecute people for soliciting, loitering, or trespassing on private property that is not clearly posted with No Trespassing or No Loitering and Soliciting allowed signage. 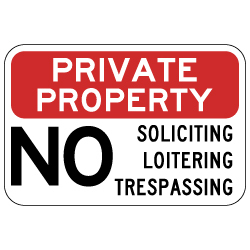 Posting good security signs like this combination No Soliciting, Loitering, Trespassing Sign is part of good property management. You not only help control what could be a nuisance and inconvenience for yourself, your employees, customers, or residents, but by properly posting your property with the right no trespassing or soliciting signs you can improve safety for everyone involved. DOUBLE the working life of your reflective No Trespassing signs by adding 3M Protective Overlay Film (POF)! 3M’s high-tech POF protects sign faces against fading caused by the sun and harsh weather—and makes graffiti and sticker defacement damage easy to clear away without harsh abrasives.